The present feature lauds the view of purslane that is now gaining in popularity, namely, that it represents edible landscaping at its best: It is free, there is no work involved in growing it, and it boasts a variety of culinary uses. The only thing keeping it from its rightful place as a respected herb is an outdated logic that says, "This plant is a weed; therefore, it must be eradicated from my landscape!" 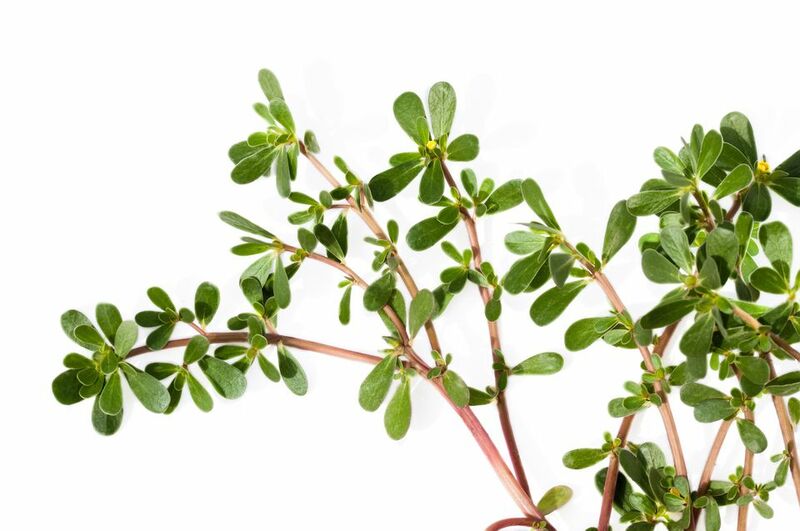 When you taste the "weed," purslane in cooking recipes and familiarize yourself with the research concerning its nutritional benefits, you might re-think that logic. Instead of fighting it as a weed, you may begin to find it eminently logical to treat it as an herb and focus on its culinary uses. Purslane herb has turned some heads at the U.S. Dept. of Agriculture, no less, reports Usha Palaniswamy, Department of Plant Science, University of Connecticut. "Purslane is receiving much attention for cultivation by the United States Department of Agriculture as part of their effort to bring about a modification in the western diet with increased intake of fresh fruits and vegetables." Purslane just happens to contain alpha-linolenic acid, one of the highly sought-after Omega-3 fatty acids. Why pay money for fish oil when you can grow your own Omega-3 fatty acids as part of your edible landscaping? Especially when it takes little effort to grow purslane since it does grow like a weed. No, purslane (Portulaca olearacea) is not yet another of those leafy "rabbit-foods" that only a Ewell Gibbons could love. Purslane is more than merely edible: It is a culinary delight. In fact, it is a succulent herb. Keep that word in mind. For "succulent" provides a hint both to the weed's identification and to its potential culinary uses. Purslane's stem is round and smooth, and it trails along the ground like a small vine. Young plants have a green stem, but, with maturity, stems take on reddish tints. The plant has small, oblong, green leaves, which form clusters. The leaves resemble small wedges and, like the stem, are juicy. Has that description whetted your taste buds yet for purslane cooking recipes? Use it raw in salads, mixed with other ingredients. Eat it raw, on its own, as a snack. Saute it as a side dish. In addition to the crispy texture you would expect from a succulent, purslane also has an interesting peppery flavor. Star chef Steve Johnson has a purslane cooking recipe for a cucumber-yogurt salad. Although you will not find it at the salad bar of your local fast-food stop any time soon, purslane has made it onto the menu of a number of upscale restaurants. But there is more to the eating of the herb, purslane than its use in gourmet recipes. Its benefits extend to nutrition. All right, so you knew that was coming. After all, what article about eating weeds doesn't eventually get around to how nutritious they are? But did you know exactly how it is good for you? Not only does purslane have five times the amount of Omega-3 fatty acid that spinach has, but it also has stems high in vitamin C. Omega-3 fatty acids are instrumental in regulating our metabolism. Purslane also contains alpha-linolenic acid (source: HealthGuidance). Now if you strive for a landscape with an immaculate lawn, it will still be understandable if you pull up all the purslane growing on it. That is the price you have to pay for perfection. But just do not throw it away! Eat it, instead. And if your purslane is growing on the edge of a garden, say, you might even consider pinching it instead of pulling it. That way, all summer you can enjoy healthful eating with this spicy succulent. Not convinced of the virtues of purslane? If you must get rid of purslane, you can, of course, hand-pull it. Hand-pulling is easiest when the soil is wet. You can also use the pre-emergent herbicide, Dimension, if you are not committed to staying organic. Purslane germinates when soil temperatures reach about 60 degrees Fahrenheit, so you will have to apply the pre-emergent herbicide by at least mid-spring (check with your local county extension). By the way, did this plant's genus name (Portulaca) look familiar to you? It should. There is an annual flower by the name, "portulaca" that is quite popular in landscaping. Portulaca is also a family name; bitterroot ( is one plant you may know that belongs to this family.